Birthdays give us a chance to have some fun. We get to write in a birthday card once a year for each of our friends. No one should have to stress out about figuring out what to write. Birthday wishes fall under a few different categories: sincere, funny, or encouraging. The best messages are personal or have something to do with the person. If humor is appropriate, then you can use one of the funny examples below. If you are looking for sincere messages you will also find those examples. Then add something specific about the person when you write your message. If you don't want to go with a funny message, you can use one of these more serious and sincere messages. Your life has been a blessing to many people. That's why I like to celebrate your birthday. You have been a great blessing to those you encounter. You have been a blessing since your original birthday. Somehow you always make me feel young even though we are both getting older by the minute. Happy Birthday to one of my favorite people to be born! You can support the Democratic Party if you want, but I support the Birthday party. Death day gets closer with each birthday that passes. I couldn't think of a message that would make you laugh for your birthday card. You’re too mature now. Some say “old is in the eye of the beholder.” I think it’s just cataracts. 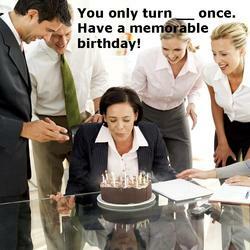 All the people I know who have had birthdays each year have eventually ended up dead. Birthdays must be bad for your health. You begin and end this life in an ironically similar disposition. You're dependent on others to feed you and dress you. You have to wear diapers. Here’s to the in between years. You remind me of the big redwood tree that you can drive through in a car. You've been around forever, and you’re too stubborn and old to be going anywhere soon. If you look back through all the years you've lived, the first thing you’ll notice is that you need a telescope. Maybe we get a little carried away with throwing parties for people when they get a year older. Shouldn't people have to accomplish something to deserve a party? One day a year you get to celebrate your birth. The other 364 days a year you get to celebrate mine. I hired a fire fighter to be on call for your birthday party, so it’s o.k. now to go ahead and light the candles. Losing some of your visual acuity as you get older is nature’s way of hiding all of the wrinkles that you would see when you look in the mirror. If I got you an all expenses paid trip to anywhere, where would you choose to go? Traveling to the past when you were younger is not an option. You know you're old when you hear your favorite song while you are riding the elevator. I heard your favorite song on the elevator. You choose your restaurant by levels of senior citizen discount. The music in the elevator is too loud for you. You can’t handle driving faster than your age in MPH. Finding your keys becomes your daily exercise routine. Everyone calls you sir or mam in the nursing home. You don’t trust anyone under 70. You blow out your candles wishing you didn't have to wear diapers. You’re glad to be over the hill because it’s so difficult to breath. The grim reaper comes to your birthday party. When you write something in a birthday card, you can make it especially fun and personal by using these following tips. Each of these are options to enhance your message, and you choose which ideas work best. First choose what type of message you need to write based on who you are writing the message for. Make your message personal and thoughtful. Most people will overlook whether or not you spent time choosing the perfect card at the store, but they will almost always read the hand written message inside the card. Write on scrap paper first, so you can edit the message. Be concise. People don’t want to read for more than about 30 seconds in a card, especially if they have several to read. Proofread for confusing word choices or errors. These will make the message difficult to understand, or will make it a slower read. This can kill the joke. "Mom, I want to let you know that you have been a great influence in my life, and you mean a lot to me. I hope you have a great birthday. Happy Birthday!" "I hope you have a blast on your birthday. You always made my birthdays fun as a kid, and I appreciate that. "Mom, it's a good thing you were born, because I wouldn't have been born if you hadn't. Happy birthday to you and me." "The older I get, the more I realize that you are really smart, and that you have taught me a lot. I hope you realize that as you get older too. Happy Birthday!" "I'm wishing a great mom a very happy birthday. You are the best mom I could have wanted." "Mom, I love you more than I usually show you. You mean a lot to me, and I appreciate you being there for me. I am not sure what else to say except, Happy Birthday!" It's not possible to come up with a list of all the things that could possibly offend a person. Everyone is different, but some things are more likely to offend someone when written in a birthday card. References to life expectancy are risky. Even though death is a natural process correlated with age, some people aren't as comfortable with reminders. Overly raunchy jokes are not just risky. They are risque. Birthdays are a good time to have fun. However, dirty jokes can be offensive even when delivered for a fun event. Stereotypes of gender, race, and religion are poor taste. The exception here, of course, is age-related stereotyped jokes. Jokes about personal flaws should be included only with great tact. Be careful of getting too specific when mentioning anything negative about the person.